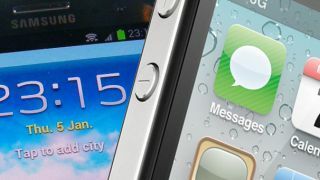 Samsung has said that it is not looking to negotiate with its fierce rival Apple, with an HTC-style settlement looking increasingly unlikely. Speaking to the Korean media, Samsung's mobile president Shin Jong-kyun revealed the firm was sticking to its guns in its continuing battle with its Cupertino-based rival. Jong-kyun was quoted by Yonhap News saying: "It may be true that HTC may have agreed to pay 300 billion won (£173 million/$276 million) to Apple, but we don't intend to [negotiate] at all." At the start of the week Taiwanese manufacturer HTC announced that it had resolved its patent disputes with Apple, agreeing a 10 year licensing deal with the iPhone maker. The ongoing game of one-up-manship between Apple and Samsung in the courts is well documented, and becoming ever more tedious, and this latest revelation will not help a resolution arrive any quicker. We now lay in wait for Apple's sarcastic response, possibly in a similar fashion to the way it "apologised" for accusing Samsung of copying its products.